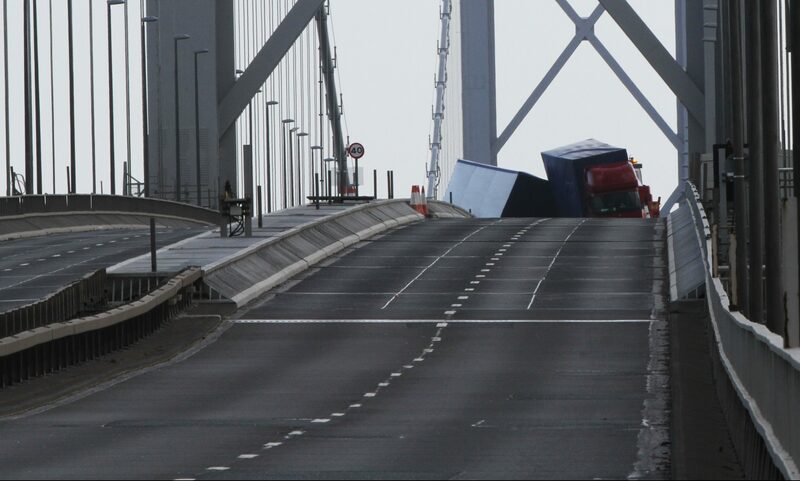 The overturned lorry on the deserted Forth Road Bridge. A lorry driver has been charged following a day of roads chaos in central Scotland on Tuesday. The 56-year-old has been accused of dangerous driving after the HGV he was driving blew over in high winds on the Forth Road Bridge. The bridge had to be closed in both directions for around three and a half hours until the vehicle could be safely recovered. Warning signs that the bridge was closed to high-sided vehicles were in place at the time of the incident at 2.45pm. Motorists endured miserable journeys as a result, with tailbacks of up to 10 miles reported as people tried to make their way across the Forth. Traffic was diverted via the Kincardine and Clackmannanshire bridges. It was the second time in two months the bridge had to be closed due to an accident involving an HGV. In January, it was shut for almost a whole day after a lorry was blown onto the central reservation damaging 40 metres of steelwork. The driver involved in the latest incident is expected to appear at Dunfermline Sheriff Court some time on Wednesday.